WASHINGTON (AP)—Andy Roddick was on the wrong side of match point, but received a reprieve when Eduardo Schwank hit his second serve into the net. The double-fault on Schwank’s second match-point opportunity gave Roddick the opening he needed to come back and win a third-set tiebreaker in a 4-6, 6-4, 7-6 (2) victory Thursday in the Legg Mason Tennis Classic. In the quarterfinals, the top-seeded Roddick will face Viktor Troicki, a 6-4, 1-6, 6-4 winner over Bobby Reynolds. In a battle of qualifiers, Samdev Devvarman beat Robert Kendrick, 6-2, 6-7 (5), 7-5 for a quarterfinal berth. Devvarman, the 2007 and 2008 NCAA men’s singles champion, was up 4-1 in the second set but lost the lead and needed three sets to earn his second career ATP win. Igor Kunitsyn won the final match of the night, a 2-6, 6-2, 7-6 (6) win against Fabio Fognini that lasted until nearly 1:30 a.m.
After the two back-and-forth sets, Roddick appeared to take the drama out of the third set when he grabbed a 4-1 lead. But Schwank stormed back and broke Roddick’s serve twice to go up 5-4 and holding serve. Schwank, who started the year ranked No. 171 and has risen to 56th, built a 40-15 lead for his match-point opportunities but his double fault seemed to turn the momentum in Roddick’s favor. 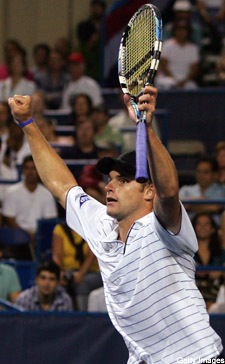 Once the match went to the tiebreaker, Roddick took control. He earned a roar from the crowd with a winner down the line to go up 5-1 and capped the win with two strong serves Schwank had trouble returning. Roddick said late in the match he noticed Schwank relying more on a serve-and-volley game, shying away from Roddick’s more aggressive play. The 2-hour, 43-minute match showed early on it would be a marathon. In the first set, Schwank broke Roddick’s serve to go up 3-2. The next game went to deuce, then to deuce again, and again—the game saw deuce 13 times, including seven break point opportunities for Roddick. In the end, Schwank held serve by running down a Roddick shot and just barely dropping it over the net to go up 4-2. Roddick was nearly broken again in the next game. After going down 40-0, he hit a ball over the stands and out of the stadium in frustration. He came back to hold serve, but Schwank ended up with the set. Roddick broke Schwank for the first time in the second set’s final game. This time, Schwank’s drop attempt went into the net. Roddick jumped up and pumped his fist when the ball hit the ground to seal the second set win. Roddick said he was more satisfied than relieved at the final outcome.